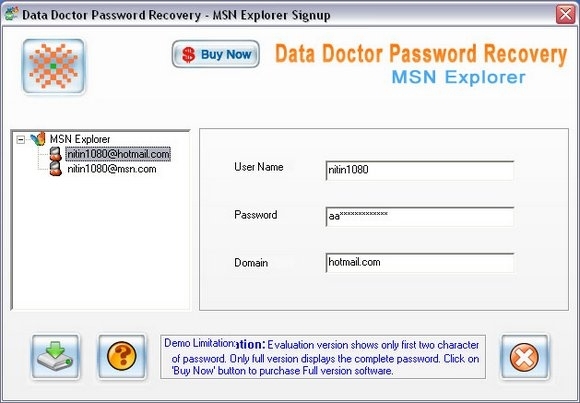 Microsoft Network explorer password restoration software is easy to use and supports all versions of MSN explorer like 4.0 5.0 6.0 as well as the latest one.  The software can display login ids as well as their relative passwords too by getting the encrypted information from MSN explorer and decrypt in front of you. You can also save that recovered passwords in safe place. 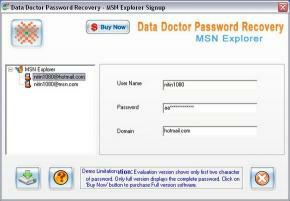 MSN explorer password recovery tool reveals forgotten misplaced login information accurately without any complications. Password recovery utility provides a solution for recovery of erased or deleted passwords and unmasks instantly all lost email ids and passwords. Password retrieval software specially made for users having multiple email accounts who has been lost their passwords by manual deletion or any computer error. You can regain back your important information data documents that are password protected on your mail accounts by getting your lost login information. The software can uncover lost login details and doesnt require any technical skill to operate it. The software easily runs on the Windows based operating systems like Windows Vista 98 2003 ME NT 2000 and Windows XP. The software can read the entire unreadable misplaced or overwritten stored passwords on MSN explorer.Features:*Software can recover exact user id and password that has been lost. *Software supports all MSN explorer versions along with latest one. *Software has easy and simple graphical user interface. *Software has easily understandable help manual.